Munich – Following FC Bayern München’s draw with Bayer 04 Leverkusen on Matchday 8, felt the Bavarians had done enough to merit a comfortable victory over their hosts. Pep Guardiola’s side were forced to settle for a draw, however, which was in no small part down to Werkself goalkeeper . Leno, who produced a string of stunning saves to deny the visitors, was just one of several standout performers last weekend, but bundesliga.com users felt the 21-year-old keeper fully deserved the Best Player of Matchday 8 award. When Toni Kroos put Bayern 1-0 up after half an hour at the BayArena, few would have bet against the record-champions cruising to a fourth straight league victory. However, Sidney Sam found an equaliser moments after Kroos's opener and despite dominating possession for the rest of the 90 minutes, the visitors couldn't find a way past the Leverkusen stopper, who pulled off save after save to keep Bayern at bay and earn his side a 1-1 draw . 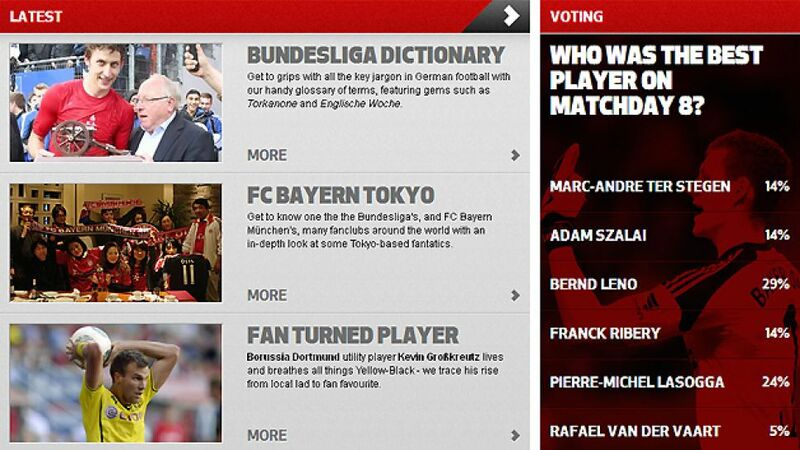 Leno won 29 per cent of the post-matchday poll, but the player in second place wasn't far behind. Pierre-Michel Lasogga's heroics in Hamburger SV’s emphatic victory at 1. FC Nürnberg on Sunday earned him a runners-up spot in the vote. The German Under-21 international’s hat-trick inside eight minutes at the Grundig Stadion helped his side to a 5-0 win and maintain the visitors' improving form under new coach Bert van Marvijk. There was a three-way tie for third place in the vote. One of those was UEFA 2012/13 Best Player in Europe Ribery, who tried everything to help his side break down a stubborn Leverkusen back-line but, try as he might, the Frenchman was unable to help his side to victory. Borussia Mönchengladbach’s Marc-Andre ter Stegen also earned 14 per cent following his performance against Borussia Dortmund on Saturday. Despite being put under intense pressure for most of the match, a Max Kruse penalty and a late goal by Raffael sealed a 2-0 win for Lucien Favre’s team. Ter Stegen made a number of impressive stops, including a brilliant double save to deny Marco Reus and Mats Hummels. Adam Szalai completed the trio in third place. The Hungarian put FC Schalke 04 2-1 up against FC Augsburg after Kevin-Prince Boateng had equalised from the penalty spot. Szalai then netted his second of the match, before a late Max Meyer strike sealed a 4-1 win at the Veltins-Arena. Last but by no means least was Hamburg captain Rafael van der Vaart. The Dutchman won five per cent of the vote after his spectacular volley from Heiko Westermann's cross and two assists for teamm-mate Lasogga set the visitors on their way to the resounding win over struggling Nürnberg.